And the fact that you don't instantly know why PARC is important is reason enough to read this painstakingly researched yet fast and fun history of the Xerox PARC, the Mac, the Internet and everything. What others thought about "Dealers of Lightning"
While Gates, Jobs, and the other big boys of Silicon Valley are basking in the glory of the information age, renowned Los Angeles Times reporter Michael Hiltzik reveals how, back in the early '70s, a group of inventors at Xerox's Palo Alto Research Center (PARC) blazed the trail for all of today's indispensable technology  from the PC to email to ATMs to meteorologists' weather maps. And they did it without fanfare or recognition from their employer. Hiltzik's Dealers of Lightning provides a fascinating look at technohistory that sets the record straight. 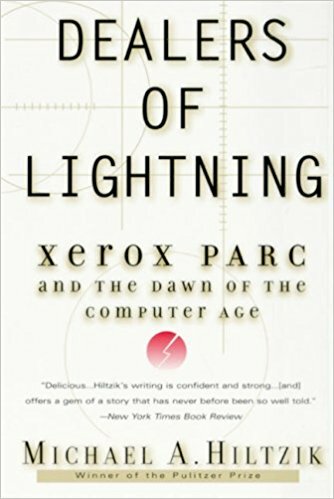 In Dealers of Lightning, Hiltzik describes the forces and faces behind the revolution that the Xerox PARC team single-handedly spawned. The Xerox PARC group was composed solely of top technical minds. The decision was made at Xerox headquarters to give the team complete freedom from deadlines and directives, in hopes of fostering a true creative environment. It worked  perhaps too well. The team responded with a steady output of amazing technology, including the first version of the Internet, the first personal computer, user-friendly word-processing programs, and pop-up menus. Xerox, far from ready for the explosion of innovation, failed to utilize the technology dreamed up by the group. Out of all the dazzling inventions born at Xerox PARC, only a handful were developed and marketed by Xerox. However, one of these inventions, the laser printer, proved successful enough to earn billions for the company, therefore justifying its investment in the research center. Most oftheteam's creations would go on to be developed and perfected by other companies, such as IBM, Apple, and Microsoft. Drawing from interviews with the engineers, executives, and scientists involved in the Xerox PARC, Dealers of Lightning chronicles an amazing era of egos, ideas, and inventions at the dawn of the computer age.